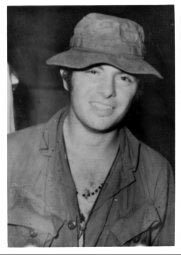 In Vietnam, 20-year old SP4 Ronald DiBartolomeo was a bobcat. That was the nickname of members of the 1st Battalion, 5th Infantry, 25th Infantry Division, operating in the area of Bien Hoa. They conducted some combined operations with ARVN (Army of the Republic of Vietnam), which could be a very hazardous kind of combat. Two members of the patrol were killed outright. Ronald was severely wounded; he died two days later. Spec. 4 DiBartolomeo was the son of Mr. and Mrs. Frankie DiBartolomeo, Springfield Township, Mercer County, PA. After graduating from Grove City High School in 1966, he studied at Youngstown State University. He was drafted into the army in September, 1969, and was sent to Vietnam in March, 1970. He was the 34th serviceman from Mercer County to die in the Vietnam war.